That was the question posed at panel organized by Zocalo Public Square, the Daniel K. Inouye Institute, and Hawaii Public Radio. From the summit of Haleakala to the beautiful beaches, bays and trails of just about every island, have we reached the tipping point for tourism in the islands? 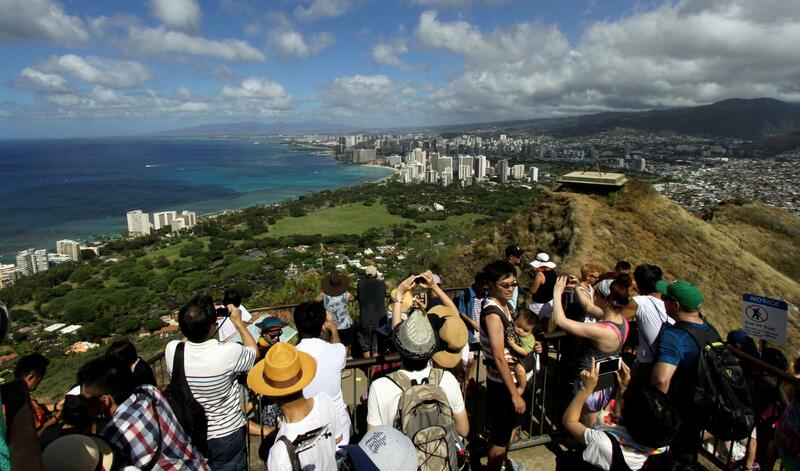 Hawaii is forecast to see 10 million tourists this year. How do we manage this before locals start to push back like they have in cities like Barcelona and beyond? Frank Haas, a marketing consultant and former vice president of tourism marketing at the Hawai‘i Tourism Authority. Peter Apo, a cultural tourism specialist and former Office of Hawaiian Affairs trustee. Martha Honey, the Executive Director of the Center for Responsible Travel is Washington DC. And John Knox, a former president of the Hawai‘i Economic Association and a public policy researcher who studies tourism. Tourism remains one of Hawai‘i’s economic pillars. And while 2017 was another year of records, the industry faces some new challenges this year. PBN editor in chief A. Kam Napier has more from a roundtable of tourism industry executives. Earlier today, Governor David Ige, through the Hawaiʻi Tourism Authority, reassured the world that "travel is safe to the Hawaiian Island." Ige emphasized that the volcanic activity is having no effect on other islands. But even though Kīlauea's latest eruptive phase is mainly affecting the Puna area, there have been a rash of island-wise cancellations for June and July because tourists mistakenly think the entire state is a disaster area. Some cruise ships are avoiding Hilo and even Kona as a port of call.